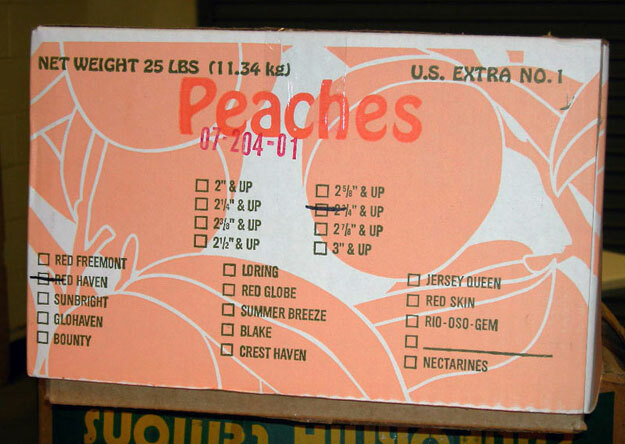 You may be receiving some bulk peaches, and the color does not appear to be as uniform as the place packs from Chile or California. You may be wondering if the peaches can be rejected based on color. As you can see from above, some of the peaches have full color, while others have the red color on 75% or less of the surface. As you begin inspecting the peaches you can visibly separate the peaches into different color categories. You also notice some of the peaches have a nice pinkish red to red color, while others only have a light pink, or blush color. Can you reject the peaches for light color? Well that depends on the grade marked on the container, or on what grade the peaches were bought, if no grade markings are found. To begin, if the peaches are marked as “U.S. No.1”, there are no color requirements at all for peaches. Meaning the peaches could have absolutely zero color, and still meet the requirements of the U.S. No. 1 Grade. If the peach carton is marked “U.S. Extra No. 1” as shown above, then you may have cause for rejection if the peaches are too light in color. To meet the requirements of the U.S. Extra No. 1 Grade the peaches must meet all same requirements as the U.S. No. 1 Grade, but in addition, 50% of the peaches must have at least 25% of the surface showing blush, pink or red color. As stated, the peaches don’t have to be red in color, but only must be at least a light pink color. So, looking at our carton, from the top image, there is no doubt that at least 50% of the peaches have at least 25% of their surface with a light pink color. If your carton has the U.S. Fancy Grade, then a different set of requirements apply. In that case, 90% of the peaches must have at least 33% of their surface showing a blush, pink or red color. As you can see, even the highest grade of peaches, U.S. Fancy has a fairly lenient color requirement. U.S. Extra No. 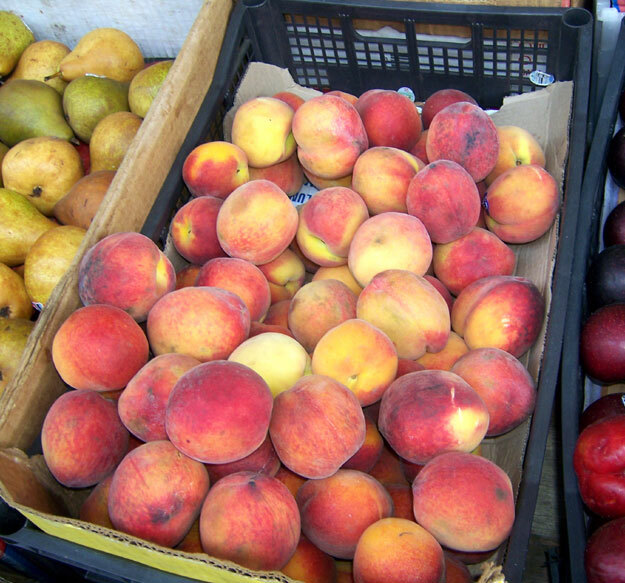 1 Grade – 50% of the peaches must have at least 25% of the surface with a blush, pink or red color. U.S. Fancy – 90% of the peaches must have at least 33% of the surface with a blush, pink or red color. Are we talking about what the consumer imagines what a ripe peach should look like or are we educated enough to know what the variables are that are different for the hundreds of varieties and maturity stage and times at harvest? There are so many variables when growing where even the soil type affects the shape or appearance of each variety grown. Red Surface Blush is a poor indicator for maturity, The Faye Alberta peach used in canning is lucky to have a tinge of blush or 25% of the surface having Red Blush. Since growers all use many of the same growing practices to help increase the blush on fruit as it grows, due to the cosmetic visions consumer equate to the best eating and ripe Peach. The amount of blush does not equate to how well matured or the eating quality a Peach will have. Also with as many varieties as we have now there are variations in the percentages of background color and blush for each variety as well as specific details for shape, maturity background color etc. An example would be a Rich Lady peach which used to be 99% full dark burgundy blush regardless. The maturity was a guess for the pickers since U.S. Matured or CA Well Matured fruit looked the same and had no background color to go by when being harvested. One sure way was to go by the only ground color that was present in the stem cavity. If the color was green or yellow determined the maturity and workers could not see this as they harvested. Cutting the fruit to observe the flesh color and, juice is the best for determining the degree of maturity. Last the time in the harvest season. Early and Late season varieties will have less blush mostly. Newer varieties are now grown that will have good blush percentage levels.